Each month we give you the opportunity to get to know members of our team. This month we speak to Felicity, one of our chiropractors. Felicity James is a registered chiropractor and was the first chiropractor to join the Durham House team in the Farnham clinic. She moved to the area following the completion of her degree in June 2008 at Cardiff, graduating with a few prizes for overall achievement and excellence in radiology. While the run-up to Christmas and New Year's Eve is the perfect excuse to indulge, it doesn't mean you have to completely abandon your health and fitness routine! Although hitting the Studio doesn't have to be a priority, if you keep up exercising you'll feel the benefits in the long term – plus you'll be able to enjoy the extra food and drink completely guilt-free! Turkey is the traditional meat of choice for this time of year – but surprisingly only for one day! That said, it’s fast becoming a preferred low-fat alternative to red meat now that it’s available minced in supermarkets. Try these spicy turkey burgers and maybe you’ll agree that turkey isn’t just for Christmas. Each month we will be giving you the opportunity to get to know members of our team. This month we meet Ian Stones BSc Hons. Lic Ac. MBAcC. - Acupuncturist. Ian graduated from the College of Integrated Chinese Medicine in 2007 with a Bachelor of Science degree in acupuncture and has been based in Farnham, Surrey for over 3 years. Ian is a member of the British Acupuncture Council, the lead professional body representing over 3000 acupuncturists in the UK. As a BAcC member, he is bound by the codes of professional conduct and safe practice ensuring he gives the highest standard of treatment. Chiropractic care is very effective in treating common gardening injuries such as lower and upper back pain, neck pain, knee and shoulder pain. If you have any aches and pains associated with gardening this autumn then don't hesitate to make and appointment. To try and prevent this from happening, here are some easy tips. The Studio Durham House, Past, Present and Future. 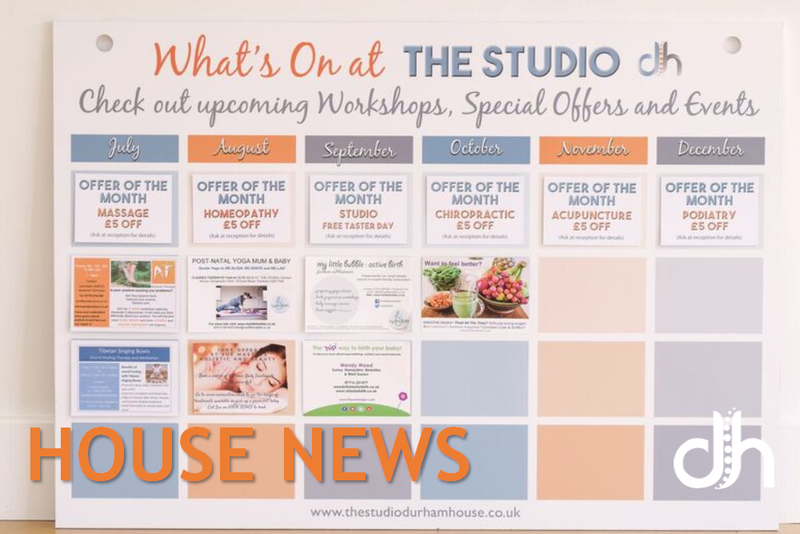 We talk to Durham House Chiropractic Clinic Managing Director Galin Lowe to discuss the past, present and future of The Studio Durham House Farnham. Click here to read the full interview from October 2017. During October we would like to invite you to try a digital detox. We have included some tips for helping you along the way. Share with us your digital detox story on Facebook or Twitter with the attached #DigitalDetoxDurham. Keep Calm it's our Birthday!! With school holidays already having started in July for many, families across the country are planning their big summer getaway abroad or on home turf. Either way, it can be hard to stay healthy when on holiday as it’s often seen as a time of indulgence, but have you ever considered the impact a holiday can have on your back health? Find out our top tips to help keep you on track during your travels. Each month we will be giving you the opportunity to get to know members of our team. This month we speak to Nick, one of our resident Chiropractors. Nick graduated in 2008 from the Welsh Institute of Chiropractic. He has since worked in the Southampton area, and moved to Durham House Chiropractic in 2015 for fresh challenges and to be closer to his family. Prior to his chiropractic training he volunteered in a physiotherapy department for physically handicapped children. Top tips whilst gardening this summer. As a nation, we love our gardens and spend a considerable amount of time and money on them. As we rush to get those jobs in the garden done, there is a risk that gardeners may injure themselves. What everyone wants is to be fit and healthy enough to actually enjoy sitting in their garden and enjoy the fruits of their labours come summer time, so here are some helpful tips from the British Chiropractic Association. Meet Fiona our resident sports massage therapist. Each month we will be giving you the opportunity to get to know members of our team. This month we speak to Fiona, one of our resident sports massage therapists. Fiona qualified as a sports massage therapist in 2007 and currently works at Durham House in Fleet and a bodybuilding gym, which offers a great spectrum of patients and injuries needing treatment. Fiona is also qualified in ultrasound therapy which helps speed up the healing process and decrease pain, as well as pregnancy massage which helps ease some of the problems that can be associated with pregnancy, such as relief of muscle tension caused by softening of the joints. Read our full interview with Fiona here. With the summer months upon us, no one wants to spend time in the kitchen slaving over a hot oven. This is the time of year for freshly grilled fish and meat and cool salads. There are so many options for lovely, filling side dishes and salads that you can make and keep refrigerated. This month’s recipe makes use of bulgur wheat, a healthy protein-rich grain traditionally used in Middle Eastern and North African cooking. Add it to your next Barbecue for a fabulous flavoursome accompaniment to marinated chicken or fish. Debunking the myths of Hypnotherapy with Viv Evans. This month we spoke with Viv Evans, a highly qualified hypnotherapist, practicing from Durham House in Farnham. Viv debunks some of the myths around hypnotherapy, explains how a typical hypnotherapy session works and reveals why her clients make her feel humble. Recently we have welcomed Sarah Brown to the team. Sarah is a registered Nutritional Therapist specialising in digestive health, hormone imbalances, weight management and energy disorders. She is also the regular author of our recipe of the month which you can view by clicking the link below. This month’s recipe focuses on broad beans. Not only are they a great source of protein, but they’re also a fantastic source of folate, iron, manganese and magnesium. Sarah suggests there are so many ways to use broad beans and dips are a great way to incorporate vegetables into your daily meals. In May we spoke to Carolyn Haynes; a patient at Durham House and s regular attendee of Rehabilitation Yoga with Cathy on a Wednesday evening at the Studio. Carolyn has been a patient of Galin's for many years and here shares what she's got out of coming to the Clinic and Studio, after a serious accident jeopardised her wellbeing and livelihood.